Potato latkes turn a side-dish vegetable into a superstar main. With the help of carrot, celariac and onion, these latkes are a sublime meal. My family's history is shrouded in one huge question mark. After my Oma died in August, I realized it probably always will be, and more than curiosity, I'm filled with regret. The last few times I saw her, I relied on our German-English pidgin to decode our past, but it's as though time only started with her parents and not a moment before. The story is even murkier on my mother's side. My Oma can spin a good yarn, but even my mom thinks there are details conveniently left out of the story. Aside from punctuality and efficiency, denial and shame are also German strengths, particularly for anyone who lived through the Second World War. For those born during and after the Nazi reign, that shame is shared. Being born in Canada hasn't lessened it, though I don't deny my German heritage. My pride becomes so swollen at times, especially during a World Cup soccer match, or when I meet someone from Germany and start yammering about how it's my favourite place in the world to visit. Still, I have learned rather awkwardly that there are people offended by my ancestry — that 12 unfathomable, horrific, inexcusable years that happened fewer than 7 decades ago have negated centuries of better times lived by an otherwise proud and good people. One unanswered question I have about my family's past, prior to Hitler's Germany, is whether we have a Jewish root in that family tree of ours. It's something my mother has always strongly believed after learning her Oma's maiden name, Kühlewein. My dad is doubtful because family trees had to be produced when couples married during the Nazi regime to prove there was no Jewish blood in anyone's past. Though my Oma and Opa Walter married without issue, it was also a time of fudged papers and beacons of heroism in a nation of sheep fed a steady diet of propaganda. So it remains one of those big question marks, though a search of Hebrew last names doesn't turn up Kühlewein but interestingly, shows Mayer in the rolls. What I am certain of, though, is a mutual love my mom and I share for Jewish food. The few trips we've taken to Montreal always included stops at Dunn's for a smoked meat sandwich. Blintzes and latkes on menus have always been a draw. Montreal-style bagels — we love us a Jewish donut. And every so often on trips to Toronto, we'd find ourselves in a Jewish deli. OK, it was Shopsy's on Front Street but for two out-of-towners who knew no better, this was the place to go for a corned beef on rye. My love runs deepest for the latke, though. As a child, when my mom made potato pancakes for dinner, I was certain she was just phoning in that night's meal. Someone didn't really feel like cooking. 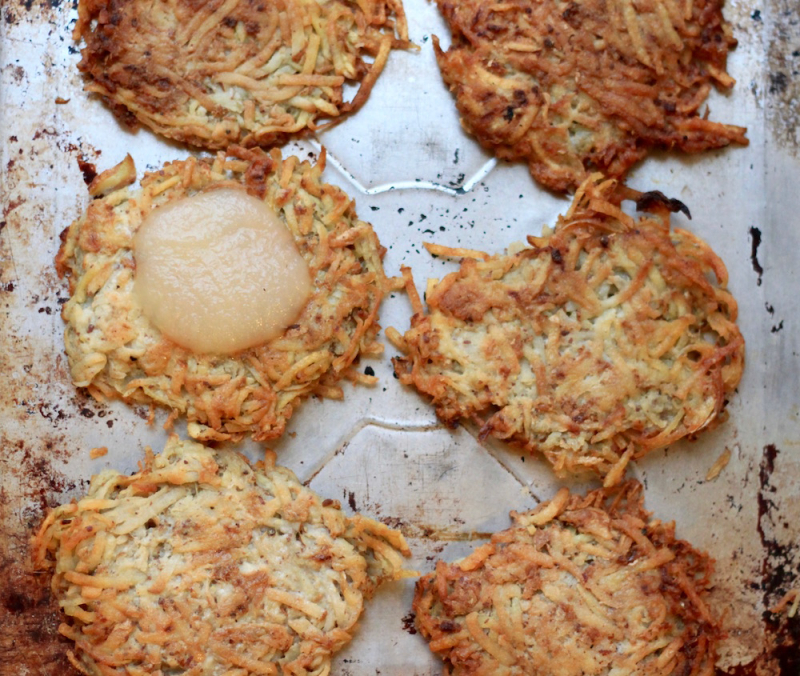 Latkes were boring, no matter how much apple sauce I layered on them. But as I got older, I realized there was an art to the latke, which is Yiddish for patch. Its preparation is a spark for serious debate among latke lovers. It's a simple food for which many feel a complicated ownership, given the seemingly many ways to properly prepare shredded potatoes — or is it mashed? Every northern and eastern European nation seems to have it's own prideful take — it's the national dish of Belarus — on the rather plain potato pancake. Do you use onions or chives? Is it still a latke if you pump up those potatoes with some carrot or zucchini? Sour cream or apple sauce as a condiment? There seem to be as many variations of latkes as there are to my family history. Despite my once unkind opinion of my mom's potato pancakes, I have a huge weakness for these deep-fried, flattened tubers. That such simple, unglamourous ingedients can make a meal so satisfying — one that I crave especially in the cold months thanks to the fatty oil bath that cooks it, the heft of the potato in my belly, and the juiciness of tart apple sauce juxtaposing it all — is nothing short of remarkable. And while I can do with shredded — yes, I'm on Team Shredded Potato — potato and chive, I do like to amp up my latkes with other vegetables that just seem to bring out the best in their tuber companions. Some might deem my choice of celeriac and carrot equally as unglamourous as the potato but that would be unfair. Sure, if different foods were all invited to a party, the potato pancake might be the one standing awkwardly by the punch bowl, next to the socially awkward cabbage perhaps, while everyone clamours to hang with the cool kids, Bacon and Kale. But they'd be missing out on the real life of the party. And then they'd go on, never knowing the truth, much like me and my family history. 1 cup grapeseed or peanut oil. Shred celeriac in a food processor or with a box grater and toss with lemon or lime juice immediately to keep it from turning an unappetizing shade of dingy grey. Set aside. Then shred the rest of the veggies. Press shredded vegetables into a strainer to squeeze out excess liquid. Press hard. Alternatively, you can scoop some of the veg mixture into cheesecloth and wring it out, repeating until all the mixture has been wrung out. Place vegetables in a bowl and combine with dry ingredients and eggs until well-mixed. Pour enough oil into a skillet to generously cover the bottom. (Don't use all the oil at once. Set some aside to replenish what's in the pan throughout cooking). Heat over medium heat to 165°C-190°C (325°F-375°F) and once hot, scoop latke mixture into tightly packed quarter-cup protions. Drop into hot oil, flattening with a spatula or the bottom of a measuring cup. Cook 3-4 minutes per side, flipping only once. If the latkes are browning too quickly, add more oil and wait until it heats to the temperature above or turn down the burner heat. The latkes should be golden with lacy edges when cooked. When latkes are golden brown on each side, transfer to a baking sheet or plate lined paper towels using a slotted spoon and keep warm in oven set to its lowest temperature until ready to eat.